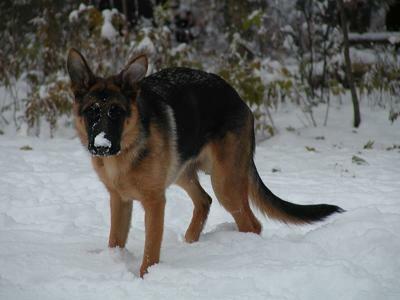 Here is a picture of our 7 month old GSD Leila, enjoying her first snow in November. She keeps us very busy. We are longtime GSD owners. They are the best!! Hey guys, thanks so much for sending in this great photo of your gorgeous GSD puppy, Leila. And I hope she keeps ya'll busy for many, many years to come! What a big girl Leila is for 7 months. She is beautiful and with those big ears. She will be very protective, take care of your puppy and she will take care of you! Very pretty and good looking young GSD female!